Now that you’ve seen this and have been busy watching real professional football since 2006, when the club’s new ownership, Mittal Steel, was announcing its’ intent to build “a Romanian Chelsea” (a project Dan Petrescu was going to implement, in the meantime, with Unirea Urziceni, using though just a couple of million Euros), you might look at the standings and say “Now that’s an example of money well spent!”. Well, keep those words and use them even if the wealthy Lakshmi Mittal has invested in Otelul Galati less than a tenth of the fortune spent when his daughter got married. 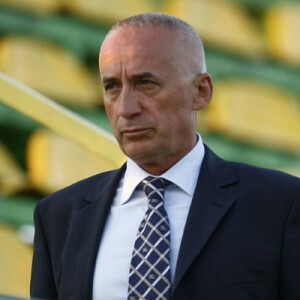 The club that was going to buy the cream of the crop in Romania and maybe even land several big names from abroad was left on a survival budget on the hands of the experienced Marius Stan. And the president did a wonderful job, proving his outstanding ability to spot and recruit players from the lower leagues, who went on to become regulars not just at club level, but also solutions for the youth national teams. Ok, he did worse when it came to signing players from abroad, his search for a top goalkeeper, for example, bringing in Liga I top “entertainers”, but even this ended last season, when Otelul landed for peanuts the consistent Branko Grahovac. Even if was a burden on the club’s finances, Stan kept the reserve team in the second division, until two years ago, when he switched to a loan system in groups, offering the chance of playing in the second and third tier both to the youngsters signed from all over the country and those raised by the club. This basic system allowed Otelul to have a large selection pool when it came to the first team’s needs and the results were outstanding: last season, a certain Ionut Neagu was called from CSM Ramnicu Sarat (bottom place in the second league and relegated to third division at the end of the campaign) and the young central midfielder had an excellent second half of season, playing on a regular basis and getting his first call-ups in the U21 national team. 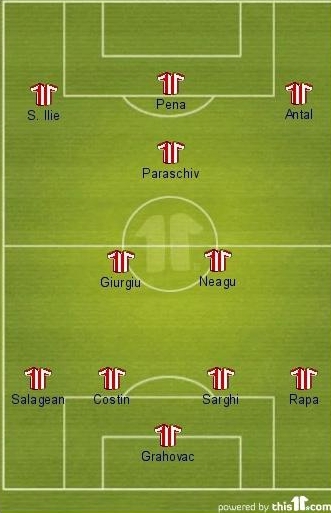 Which, by the way, relies on a very strong group from Otelul, with the likes of Cornel Rapa (right back), Silviu Ilie (left back / left midfielder), Razvan Ochirosii (left winger), Liviu Antal (right winger) getting the same attention as the already mentioned defensive midfielder. This good mixture of hungry youngsters and honest experienced players was modelled by “Munti” in a tactical setup that was so often used in the 1. Bundesliga, a few years ago. A 4-2-1-3, with specific tasks for the wingers and a vital role for the man behind the lone striker. Who’s, obviously, the team’s leader, Paraschiv. Otelul’s ability to hold the lines and find the right distances between players is key, as the talented youngsters lack consistency and the odd mistake comes more often than you’d expect from a winning team. Still, the off the ball movement and the paths worked in training allow them to get often in good attacking positions, making up for the errors in control and delivery that do appear at decent forwards like Pena or Borbely, who look good only when they hit top shape, for two or three games per season. The team’s strength – which failed to deliver so far just in the 0-4 defeat against FC Vaslui, with the away loss in Cluj a bit harsh – is the solid backbone, formed by Grahovac (GK) – Costin (C/DF) – Giurgiu (C/MF) – Paraschiv (C/AMF), all experienced players, who are used to do their job no matter the opponents’ names. Players who fully deserve to see the entire division below, as they keep their heads down, at least a day week per season. Or more?